This top or knit dress comes packaged with the Hopscotch skirt pattern and provides you with many different sewing options. The top/dress portion of this pattern is designed for knit fabrics with at least 25% stretch. The City Weekend knits are great for this and have much more than 25% stretch. But you’re certainly not limited to just our fabric. You can use jersey, textured knits, or any interlock fabric as long as it has at least 25% stretch. I’ll explain more about different knits and how to measure stretch in another post. 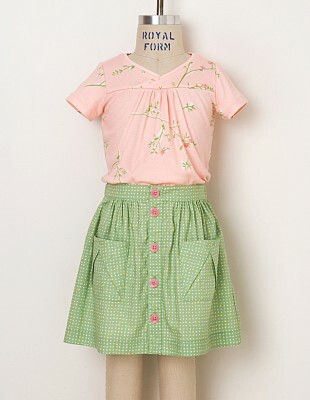 I like the styling of this top because it looks great on children at every age. 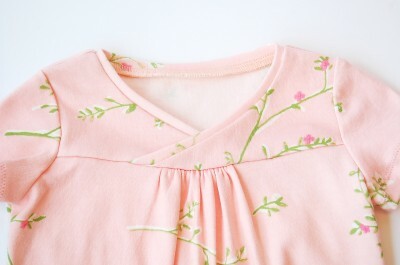 The front yoke is slightly gathered, and the binding at the neck takes advantage of the stretch in knits. It fits over the head without being too wide when the top or dress is worn. And isn’t it nice not to have any closures like buttons or zippers? That alone might convince you to try sewing with knits. Remember how I said that sewing with knits is fast? The lack of closures certainly contributes to this. Of course you can make this style with long sleeves (View A) or short sleeves (View B), and either as a top (View A) or a dress (View B). Mix the two views to get lots of options. In the photo above we combined the short sleeves from View B with the View A top. The dress version looks great with sandals in the summer or tights and boots in the winter. We mixed two different City Weekend interlock prints to give the dress in this photo a contrast yoke. The dress could also be used to make a cute, comfortable nightgown. 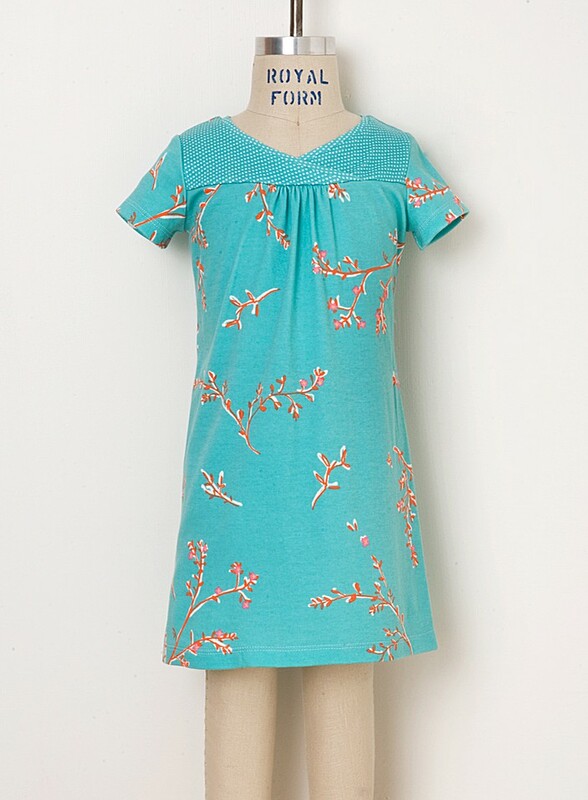 And, speaking of sleepwear, you could combine the top (View A) with the Nature Walk pants to make a set of extra-comfortable knit pajama set for some special little girl. Have already been thinking of mix-and-match PJs! Thanks for showing the dress version. I was having a difficult time imagining it from the drawing on the package. I love this! You are killing me, the last thing most would think I needed was more patterns but I have to have all 4 of your new patterns this year! I’m more than tempted to try sewing with knits!!! I’m beginning to plan what fabrics to use with the new patterns. Will you be giving us fabric requirement for the new patterns soon? Jeanie, the fabric requirements are all posted in the discussion forums section of the website. That color pink is my all-time favorite shade. Love the top! Funny you suggest that this could be a nightgown- I have been looking for a pattern to make nightgown for my almost 3 year old. Then, when I saw that this pattern could be a dress as well, I totally thought that this was going to be her nightgown! I am so excited for these patterns! Knits have never really been my ‘thing’, but I absolutely adore that floral sprig print, I will definitely have to purchase several yards of each colour way for my stash, it is perfection in this pattern. I cannot wait to try this pattern- I’ve never said that about using knits before! And the new fabric line is so pretty. apologies for the above typos! ooops! These posts are brilliant for showing all the options available, I love to see that there’s a dress optionas well as shirt and skirt. Are the fabrics in your City Weekend line a one-time run? I expect they may be, so I have already purchased quite a bit of it. I saw the collection in a coming soon preview and was instantly struck by the combination of colors and patterns. I love the large orange dot fabric — and I’m not a big fan of orange. There is something about the color that you got exactly right. I am making the quilt for my son’s girlfriend. I can’t wait to see it finished. They’re 22 & 23 and both loved all the fabrics too. You’ve also inspired me to try creating the hopscotch outfit for the 5 year old next door. Your entire collection is beautiful. Thanks. I can’t wait to see what’s next!